A Law Enforcement exchange program from Kenya visited the Red Wing Police Department in Minnesota to discuss the partnerships involved in community policing. “Public-Private Partnerships are fundamental and inescapable,” pronounced an American speaker when explaining the U.S. system of government to a recent group of International Visitor Leadership (IVLP) participants. 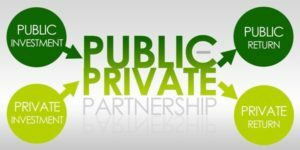 This couldn’t be truer—regardless of the subject, one of the most salient aspects of any professional exchange program is the prevalence of public-private partnerships (P3s). Whether in support of business and economic development or other social, cultural or academic initiatives, P3s are the rule, and International Visitors take notice. In fact, often the first example of an American P3 is the Department of State’s partnership with the National Program Agencies, Global Ties and the Community Based Members who arrange their itineraries. Federal contracting has grown significantly since the early 2000’s, with the range of government partners spanning businesses (large and small), universities, non-profit organizations, service providers, and community stakeholders. This proliferation of public spending would indicate an increase in public-private partnerships across a broad spectrum of issue areas, especially those focused on innovation and efficiency. A recent IVLP program for Kenyan police officers studying community outreach and social media highlighted a broad range of partnerships between the police in different communities and non-profit service organizations, schools and businesses. Athletic leagues, youth leadership groups, and neighborhood associations all work together with municipal police departments to support violence-free neighborhoods and personal development for local youth. P3s like these give government entities the flexibility and community connections they need to succeed. Regardless of the IVLP program topic, some basic research should uncover and reveal the nature of public-private partnerships in any community. And you can be sure that the international participants will be impressed by how these P3s facilitate the design, implementation and maintenance of projects and policies across sectors in the U.S. For additional information on P3s, please click here. Please share any thoughts you have with us on this or any other programming topic. The Program Theme Spotlight is intended to promote ideas, brainstorming and best practices on frequent international exchange project topics. POST TAGS: IVLP, Meridian Impact, P3, partnerships, Professional Exchange, Public Diplomacy, public-private partnerships, State Department, U.S. Department of State.